Gardens of the High Line, by Piet Oudolf and Rick Darke, offers an in-depth view into the conceptual origins, planting designs, plant palette, and stewardship of this landmark achievement. It reveals a series of multi-season gardens that owe their vibrancy to dynamic communities of responsibly chosen native and introduced plants. It also offers insights and inspiration for gardeners and garden designers looking to recreate its iconic, naturalistic aesthetic and to adopt its progressive management strategies. 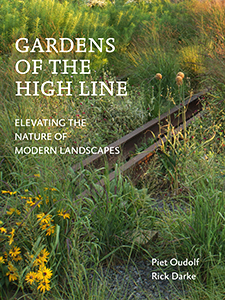 Featuring stunning photographs by Rick Darke and an introduction by Robert Hammond, the founder of the Friends of the High Line, this large-trim, photo-driven book is a must-have for anyone who appreciates the nature - the essential character - of design. 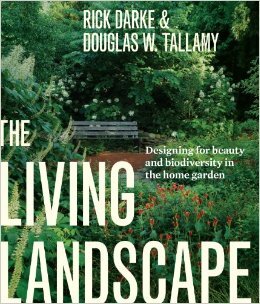 Douglas W. Tallamy's award-winning Bringing Nature Home revealed the pressing need for a biodiverse home landscape. In a gorgeously illustrated, inspirational, and practical way, The Living Landscape supports this message by showing gardeners how to make it happen.This collaboration between Rick Darke and Doug Tallamy greatly expands on Darke's American Woodland Garden and The Wild Garden: Expanded Edition, and Tallamy's Bringing Nature Home to present an inclusive vision of the vital roles native plants can play in beautiful, ecologically sound and broadly functional residential landscape design. Drawing from first-hand experience and research in wild habitats and diverse gardens, the authors employ five hundred photos and over sixty thousand words to detail their approach and strategies for creating richly layered landscapes that sustain both humans and wildlife. 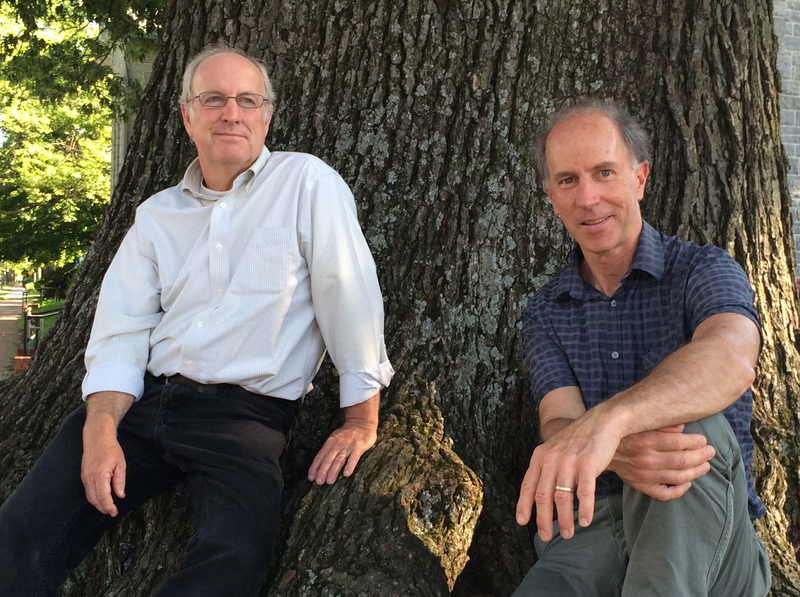 The Living Landscape is organized by chapters on Layers in Wild Landscapes, The Community of Living Organisms, The Ecological Functions of Gardens, The Art of Observation, and Applying Layers to the Home Garden. ISBN-10: 1604694084 ISBN-13: 9781604694086 Timber Press, Portland, Oregon. 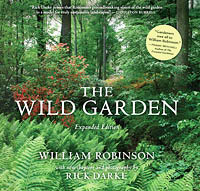 "Rick Darke proves that Robinson's groundbreaking vision of the wild garden is a model for truly sustainable landscapes." "this new edition is two books in one, and a handsome volume at that. Henry Mitchell said it all when he claimed gardeners owe all to William Robinson. We do, and this book is the perfect way to appreciate that statement"
William Robinson's revolutionary book, The Wild Garden, envisioned an authentically naturalistic approach to gardening that is more vital today than ever before. First published in 1870, The Wild Garden evolved through many editions and remained in print through the remainder of the author's lifetime (1838–1935). In the book, Robinson issued a forceful challenge to the prevailing style of the day, which relied upon tender plants arranged in rigidly geometrical designs. In sharp contrast, Robinson advocated for the use of hardy, locally adapted native and exotic plants arranged according to local growing conditions. Robinson's vision was inspired by his first-hand observations of natural habitats in Europe and North America, and he put his ideas into practice in his own garden at Gravetye Manor in West Sussex. The Wild Garden was ground-breaking and hugely influential in its day, and is stunningly relevant to twenty-first century gardeners and landscape stewards seeking to adopt sustainable design and management practices. In addition to the complete original text and illustrations from the fifth edition of 1895, this expanded edition includes new chapters and 112 color photographs by award-winning photographer and landscape consultant Rick Darke. His new material places wild gardening in modern context, underscoring Robinson's importance in the evolution of ecological design and illustrating an inspiring diversity of contemporary wild gardens. The potent combination presented here makes this new edition of a timeless classic an essential resource for all who wish to know how we have arrived at our present understanding of gardens and what opportunities lie ahead. As will be immediately clear to anyone who leafs through this book, Robinson's urgent message continues to resonate. ISBN-10: 0881929557 ISBN-13: 9780881929553 Timber Press, Portland, Oregon. 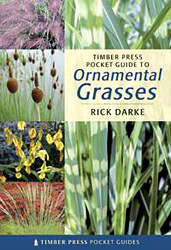 Publisher's description: "In his unique and often thought-provoking new book, award-winning author Rick Darke promotes and stunningly illustrates a garden aesthetic based on the strengths and opportunities of the woodland, including play of light, sound, and scent; seasonal drama; and the architectural interest of woody plants. An alphabetical listing of woodland plants offers useful advice for every garden, emphasizing native trees, shrubs, vines, ferns, grasses, sedges, and flowering perennials that fit the forest aesthetic. More than 700 stunning photographs, taken by the author, show both the natural palette of plants in the wild and the effects that can be achieved with them in garden settings. 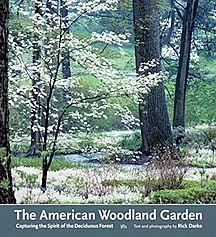 The American Woodland Garden is a clarion call to a new awareness of our relationship to the natural world. This book will take its rightful place among the classic works that have influenced our concept of the American landscape." and the Garden Writers Association Golden Globe Award for book photography. 378 pp, 10 x 11", hardcover, 738 color photos, 4 color charts, 2 line drawings. August 2002 List price $49.95.00 ISBN: 0-88192-545-4 Timber Press, Portland, Oregon. With more than twice as many photos and nearly twice the word count, this new book completely eclipses and extends far beyond the scope of Darke's award-winning prior encyclopedia, The Color Encyclopedia of Ornamental Grasses (Timber Press, 1999). 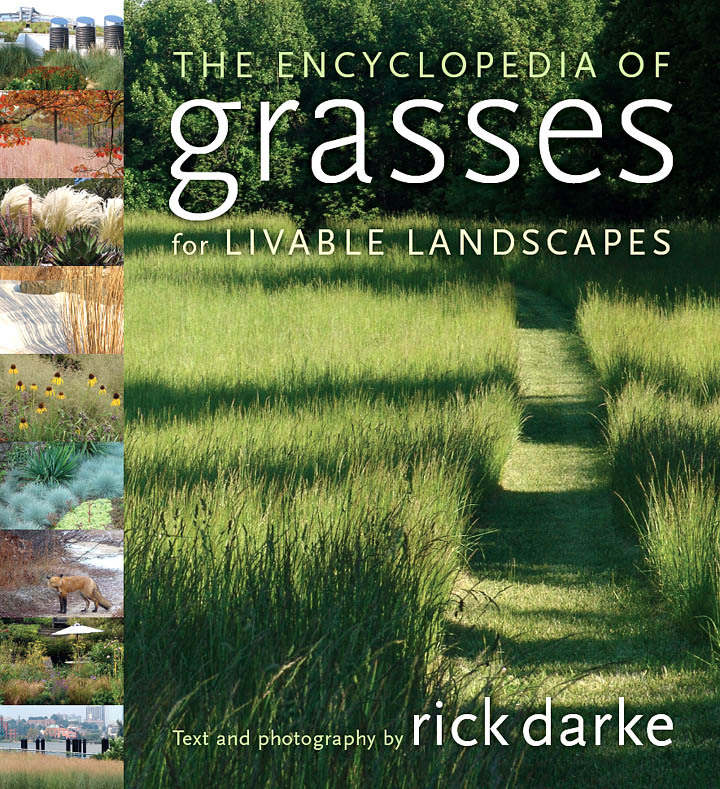 Publisher's description: "In this new book noted grass expert and advocate Rick Darke addresses both the aesthetic qualities of grasses in private gardens and the opportunities and challenges of using them in wild and constructed public landscapes. All the true grasses, sedges, rushes, restios, and cattails that possess ornamental merit or that can contribute to ecological plantings are described, and practical matters of propagation, growth, and maintenance are also covered. More than 1000 stunning photographs show details of individual plants and hundreds of gardens and landscapes in which grasses play a prominent part. This worthy successor to The Color Encyclopedia of Ornamental Grasses is a new type of design reference that sets a standard for inspired, sustainable use of grasses." In addtion to multi-city lectures in the USA, Rick Darke launched this new book at the Royal Horticultural Society's Chelsea Flower Show in London, May 2007 from the Gold Medal Award-winning Knoll Gardens stand. Publisher's description: The Timber Press Pocket Guide to Ornamental Grasses provides an accessible and comprehensive reference to the wide range of grasses available to the gardener. Building on Darke's bestselling The Color Encyclopedia of Ornamental Grasses, the guide describes many new species and cultivars, includes dozens of new photographs, and presents cultivation information and descriptions in a handy, compact format. Covering 530 species and cultivars and illustrated with 320 color photographs, Timber Press Pocket Guide to Ornamental Grasses is a valuable complement to Darke's Color Encyclopedia. Its convenient format makes it an ideal reference to take to the nursery or garden center. Publisher's description: With text and photography by Rick Darke, this full-color book highlights magnificently preserved or restored Arts and Crafts gardens in both England and North America, discussing the philosophy that informed their design and the place they hold within the movement. The Arts and Crafts landscape aesthetic is interpreted for today's gardeners, allowing them to incorporate the simplicity and harmony that distinguishes the style into their own outdoor spaces. The book details specific ways readers can bring Arts and Crafts elements to their homes and gardens, such as including pergolas that effectively link house and garden or by planting native species that add a compelling sense of place. Part Three: Arts and Crafts Gardens Across America provides unique and thorough coverage of Arts & Crafts people and places in North America, including Gustav Stickley, Henry Chapman Mercer, Rose Valley, Greene & Greene, Frank Lloyd Wright, and Bok Tower Gardens. 10" x 11 1/4", 160 pages, full color throughout. Softcover (currently unavailable new) list price $19.95. ISBN: 1586632183 ©2001 Michael Friedman Publishing Group Inc. Hardcover (currently unavailable new) list price $35.00 ISBN: 1567999042 ©2000 Michael Friedman Publishing Group Inc. Readers interested in the Arts & Crafts Movement will find a wealth of new inspiration in The Wild Garden: Expanded Edition from Timber Press. "This book is a model when it comes to the encyclopedic portraiture of plants"
Until it was eclipsed by Darke's own Encyclopedia of Grasses for Livable Landscapes (April 2007 - see top of this page), this book was the best illustrated, most complete reference on ornamental grasses, featuring over 500 full color photographs of garden-worthy grasses, sedges, rushes, restios, cat-tails and bamboos. Many grasses are pictured in multiple seasons. 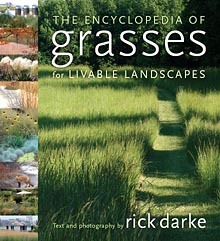 Includes chapters on The Beauty of Grasses, The Families of Grasses and Their Relatives, The Names of Grasses, Learning from Grasses in Native Landscapes, Designing with Grasses, Growing and Maintaining Grasses, and the Encyclopedia section. Intended for gardeners in a wide range of situations and climates this book draws from the experience and creativity of great gardens and gardeners around the world. An invaluable tool for landscape architects, garden designers, nursery professionals, and home gardeners seeking to extend their knowledge of these beautiful and useful plants. Foreward by Kurt Bluemel. 325 pages. 8 1/2" X 11" hardcover. $49.95 ISBN 0-88192-464-4 ©1999. Timber Press, Portland, Oregon. A CDROM version of this book was produced by Timber Press, including over 200 additional photos.